In just about every story on renewable energy, there’s a familiar cast of characters: green power developers, utilities, and sundry state and federal regulators. But there’s one key player that often lurks in the background – the grid operator. In the Golden State, most of the power grid is controlled by the California Independent System Operator. Based in a suburb of Sacramento, Cal ISO, as it’s known, essentially ensures that electricity supply and demand stay in balance to prevent brownouts, blackouts, and other catastrophic failures. The agency also approves requests for big solar power plants, wind farms, and other renewable energy sources to connect to the grid. You may win approval for your project from the California Energy Commission and the United States Interior Department, but unless Cal ISO gives you the green light to plug into the grid, that big solar farm is nothing but a big white elephant. The prospect of thousands of megawatts of intermittent sources of electricity like solar and wind jolting the grid — and then blinking off when a cloud passes overhead or the wind dies — poses a huge balancing act for grid operators. That’s especially true in place like California, which has mandated that a third of its electricity be generated from renewable sources by 2020. So it was significant, if little noticed, when Cal ISO this month announced it would begin to integrate energy storage devices like batteries and flywheels into the grid. Energy storage is increasingly seen as crucial for greening the grid. Electricity from wind farms, which in California typically generate the most power at night when demand is low, could be stored in giant battery arrays and released during the day when demand and rates rise. 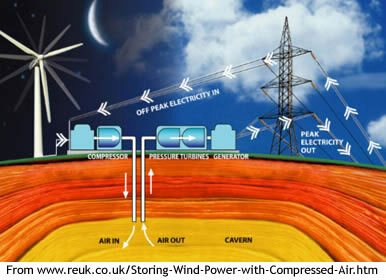 Utility Pacific Gas & Electric, for instance, plans to store energy in the form of compressed air pumped into a cavern. When needed, the air would be released to power an electricity-generating turbine. The utility is also exploring using renewable energy to pump water uphill to a reservoir. When demand spikes, the water would be allowed to flow downhill and run a turbine. Another utility, the Sacramento Municipal Utility District, plans to install lithium ion battery arrays at solar-powered homes to store electricity produced by photovoltaic arrays. And last year, the California Legislature passed a law requiring regulators to determine if the state’s three big investor-owned utilities should be required to generate a certain percentage of electricity from energy storage. Cal ISO’s early energy storage plans are modest, with just an initial 5 to 10 megawatts of storage integrated into the grid once federal officials given their okay. But it’s likely to be only the start. The California Legislature has passed the nation’s first energy storage bill, which could result in the state’s utilities being required to bank a portion of the electricity they generate. Assembly Bill 2514 now heads to the desk of Gov. Arnold Schwarzenegger, who has made climate change and green technology his political legacy as his final term winds down. Energy storage is considered crucial for the mass deployment of wind farms, solar power plants, and other sources of intermittent renewable energy, as well to build out the smart grid. On the West Coast, for instance, the wind tends to blow hardest at night when demand for electricity is low. If utilities can store that wind-generated power — and energy from solar farms — in batteries, flywheels, and other devices, they can avoid building and firing up those billion-dollar, greenhouse gas-emitting, fossil-fuel power plants that are only used when demand spikes. AB 2514 won the support of Jerry Brown, the California attorney general who is the Democratic candidate for governor. The Sierra Club and union groups also support the measure. Various business organizations, including the California Chamber of Commerce, opposed the bill. Sponsored by Assembly member Nancy Skinner, a Berkeley Democrat, the bill was stripped of its more stringent provisions by the time it emerged from the legislative sausage-making process on Friday. Originally, AB 2514 required California’s three big investor-owned utilities — PG&E, Southern California, and San Diego Gas & Electric — to have energy storage systems capable of providing at least 2.25 percent of average peak electrical demand by 2015. By 2020 the target would rise to at least 5 percent of average peak demand. The bill now only requires that the California Public Utilities Commission determine the appropriate targets — if any — for energy storage systems, and then require the Big Three utilities to meet those mandates by 2015 and 2020. Publicly-owned utilities must set energy storage system targets to be met by 2016 and 2021. Still, AB 2514 is a significant step and could ultimately help jump-start the market for energy storage, which remains in its infancy. PG&E, for instance, plans to build an experimental facility that would tap electricity generated during peak wind farm production to pump compressed air into an underground reservoir. When demand jumps, the reservoir would release the air to run electricity-generating turbines which are capable of producing 300 megawatts of power. And last week, PG&E proposed building a “pumped hydro” storage system. As its name implies, the system would pump water from one reservoir to another reservoir at a higher elevation during times of peak renewable energy production. Water in the upper reservoir would then be sent back downhill to power a turbine when electricity demand begins to spike. The holy grail of renewable energy is a solar power plant that continues producing electricity after the sun goes down. A Santa Monica, Calif., company called SolarReserve has taken a step toward making that a reality, filing an application with California regulators to build a 150-megawatt solar farm that will store seven hours’ worth of the sun’s energy in the form of molten salt. Heat from the salt can be released when it’s cloudy or at night to create steam that drives an electricity-generating turbine. The Rice Solar Energy Project, to be built in the Sonoran Desert east of Palm Springs, will “generate steady and uninterrupted power during hours of peak electricity demand,” according to SolarReserve’s license application.